Aren't they so puurty?! And they were damn good too! Apples, lemon juice, sugar, flour, salt, cinnamon, nutmeg, all spice, vanilla extract and BUTTER!!! And now for the recipe! You can find the full one here as well as some of the bakers' tips. I always wanted to bake growing up, but there never seemed to be enough time, space or ingredients, so I indulge now as much as I can. To make the crust: In a medium bowl, whisk together the flour and salt. Work in the shortening until the mixture is evenly crumbly. Dice the butter into 1/2" pieces, and cut into the mixture until you have flakes of butter the size of a dime. Add the water 2 tablespoons at a time, mixing with a fork as you sprinkle the water into the dough. When the dough is moist enough to hold together when you squeeze it, transfer it to a piece of wax or parchment paper. It's OK if there are some dry spots in the pile. Use a spray bottle of water to lightly spritz these places; that way you'll add just enough water to bring the dough together without creating a wet spot. Fold the dough over on itself three or four times to bring it together, then divide it into two pieces, one about twice as large as the other. The larger piece will be the bottom crust; the smaller piece, the top crust. Pat each piece of dough into a disk about 3/4" thick. Roll each disk on its edge, like a wheel, to smooth out the edges. This step will ensure your dough will roll out evenly, without a lot of cracks and splits at the edges later. Wrap in plastic and refrigerate for 30 minutes before rolling. Lightly grease a 9" pie pan that's at least 2" deep. This will make serving the pie easier after it's baked. To make the filling: Combine the sliced apples and lemon juice in a large mixing bowl. In a small bowl, whisk together the sugar, flour, cornstarch, salt, and spices. Sprinkle the mixture over the apples, and stir to coat them. Stir in the boiled cider (or apple juice concentrate) and the vanilla, if you choose to use it. Roll the larger piece of pastry into a 13" circle. Transfer it to the prepared pan, and trim the edges so they overlap the rim of the pan by an inch all the way around. Spoon the apple filling into the pan. Dot the top with the diced butter. Roll out the remaining pastry to an 11" circle. 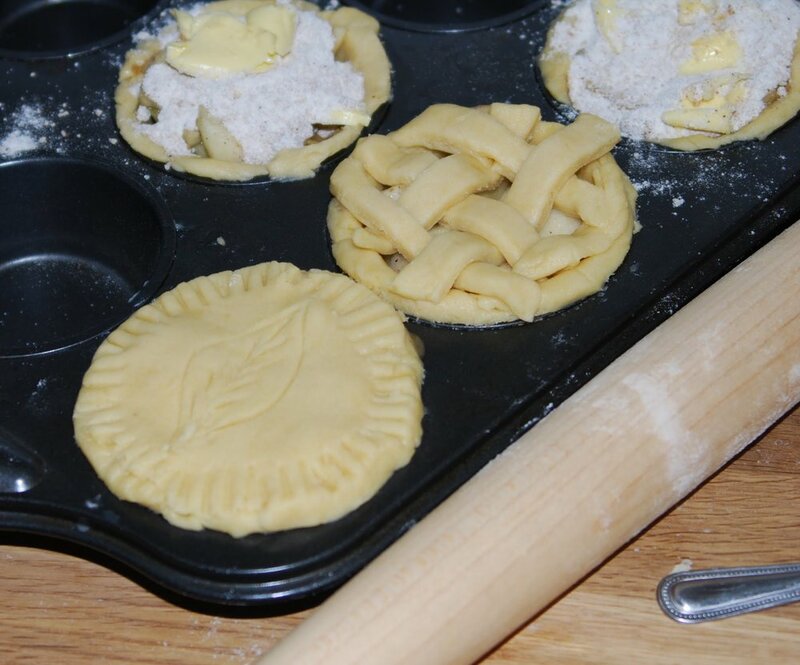 Carefully place the pastry over the apples. Bring the overhanging bottom crust up and over the top crust, pinching to seal the two and making a decorative crimp. Prick the crust all over with a fork, to allow steam to escape. Or cut decorative vent holes, if desired. Alternatively, you can weave a lattice. For extra crunch and shine, brush the top crust with milk (or an egg white beaten with 1 tablespoon of water), and sprinkle with coarse sugar. Crimp the edges of the pie, then place it in the refrigerator for 10 minutes to firm up the crust while the oven finishes heating. Place the pie on a parchment-lined baking sheet. Bake the pie for 20 minutes, then reduce the oven temperature to 375°F and bake for 40 minutes more, until you see the filling bubbling inside the pie (and perhaps dripping onto the parchment). Check the pie after half an hour of baking time, and cover the edges with foil or a pie shield to keep them from browning too quickly, if necessary. When the pie is done — you should see the filling bubbling vigorously, either around the edges, or via any decorative vents — remove it from the oven. Cool the pie completely before slicing — really. Cutting any fruit pie that's still warm is a messy business. The filling continues to thicken as the pie cools, and if you cut it too soon it will run out all over the place. It's better to bake the pie in advance, cool it completely, then warm each slice as needed after it's been cut. Store any leftover pie, lightly covered, at room temperature for several days. Freeze for longer storage. *Substitute 1 1/2 teaspoons apple pie spice, if desired.